At JVC, we strive to make purchasing our Procision products as simple as possible and an experience that can be made with confidence. To that end, JVC has carefully identified a select group of Procision retailers who share our high standards and have made a commitment to provide you with information, support and service. Most importantly, we do not authorize online or phone sales of our Procision home theater products. They are available only at JVC authorized Procision dealers with a store front. Provide access to JVC Authorized Service. Please click on the link below for a list of JVC authorized retailers. For these reasons, you should make sure to purchase products only from a JVC authorized Procision retailer. The DLA-RS4500K is the ultimate projector for discerning individuals who want uncompromised large screen performance in their home. It represents a giant leap forward in front projection, delivering exquisite native 4K high dynamic range (HDR) images at a brightness that fills even the largest home theater screens. It features three JVC-developed native 4K D-ILA devices combined with our exclusive BLU-Escent laser phosphor illumination that delivers 3,000 lumens with a 20,000 hour operational life. In addition, the new laser light source offers dynamic light control for an infinite contrast ratio (∞:1). 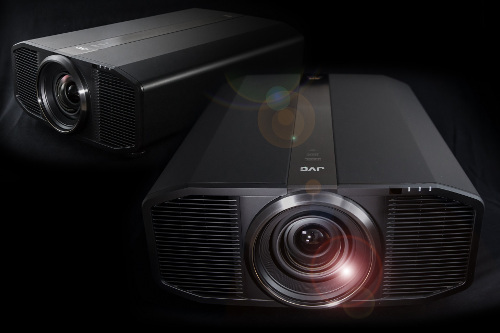 To further ensure that the projector delivers bright, high-quality 4K images, it features a new 100mm high-resolution lens developed specifically for 4K applications, and a new Cinema Filter for a wide color gamut. Using the Laser Diodes as the light source, light output can be controlled instantly enabling a contrast ratio of ∞:1. The DLA-RS4500K controls the laser output accordingly to the scene's brightness, which creates a picture that is as close to human perception as possible. An 18 element 16 group all glass lens and full aluminum lens barrel has been specically engineered for the DLA-RS4500K's 4K performance. Chromatic aberration and color fringing are minimized even when utilizing lens shift, resulting in precise projection of 4K content. In order to project 4K resolution to every corner of the screen, the new lens diameter is now 100mm, compared to 65mm used in previous JVC projectors. This lens allows a wide shift range of ±100% vertical, ±43% horizontal for a 16:9 image (±40% horizontal for a native 17:9 image). HDR content such as UHD Blu-ray discs incorporate extended dynamic range, 10bit color and BT.2020 color gamut. This demands exceptional specications and exacting performance from display devices. The DLA-RS4500K, employs high native contrast ratio with BT.709 and Digital Cinema Initiative (DCI) color gamut with BT.2020 color mapping, dynamic light source control and high brightness let you experience a full complement of HDR content. HDR content from various sources can be adjusted depending on screen size and screen type based on picture preferences. 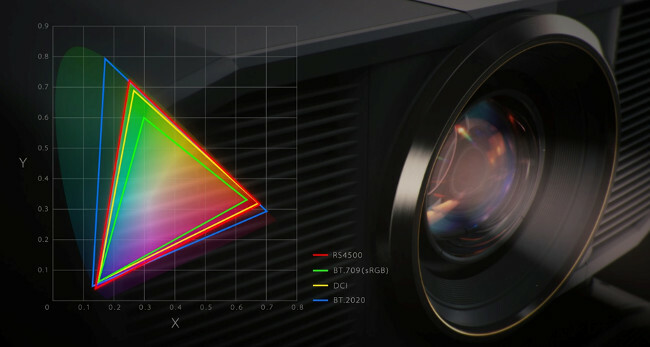 The new BLU-Escent™ light source and new Cinema Filter achieve over 100% DCI-P3 color space and over 80% coverage of BT.2020 color gamut. The gradation of sky or sea, the various colors of red in a crimson rose, and the countless colors of green of trees can be reproduced more vividly. The DLA-RS4500K reproduces stunning imagery and color when utilizing UHD content. The DLA-RS4500K features an all-new cosmetic design, with a symmetrical cabinet that combines aluminum and matte black paint for a luxurious appearance while also reducing reflections. The center-mounted lens is set off from the black body by a gold alumite ring. For cooling, the rear intake/front exhaust fan adapts to the installation environment to maximize its effectiveness, and it employs a professional level air filter that can withstand severe conditions.